When someone starts taking an interest in model railways, quite frequently, they get bombarded by different information on scale and gauge and get utterly confused; so lets try and cut through the baloney and get some facts straight. Many modellers don’t realise that the lettering system actually represents different things in different countries, for example: N “size” models in the UK are produced to a different scale than Europe and the US, which in turn is different from Japanese N scale – the only things these N scale models have in common is the track gauge. I prefer to refer to the lettering system as “sizes” as it doesn’t really reflect scale. Gauge then is, quite simply, the distance between the rails. The majority of real railways use a gauge of 4ft 8½ in or “standard gauge”, there are other railways with both narrower and wider gauges than this (e.g. 3ft or 5ft 3in) – but I’ll come back to that later. In indoor modelling terms by far the most popular “off the shelf” size in the UK is “OO” – or as many manufacturers call it now “OO/HO”. This is an amalgamation of a commonly used model track gauge 16.5mm track (which is correct for 1:87 / 3.5mm per ft / “HO”) and a slightly larger scale (1:76 / 4mm per ft) – the reasons for this inaccuracy are quite simply, size. Back in the 1930s when the smaller scales started being manufactured mechanical parts such as motors were relatively bulky, and the manufacturers decided to give themselves a bit of extra room inside small (in world-wide terms) British locos by increasing the scale while sacrificing a bit of accuracy to use standard components. Now motors have got smaller there is no need for it – but far too many OO/HO trains have been sold to allow any commercial change to happen. You may hear some enthusiasts talking about “EM” or “P4” or even “American OO” – these are all still 1:76 scale but use different track gauges to more accurately reflect standard gauge (respectively 18mm, 18.83mm and 19mm). All of these are the preserve of experienced modellers as for the time being, at least, you have to be competent in building complex kits or from scratch. The second most common size is “N”. Once again British N is a compromise and again mainly for the same reasons as OO. When Arnold, a German manufacturer, introduced the concept in the 1960s the mechanisms wouldn’t fit inside a scale 1:160 body of a British loco; British N scale is therefore to the slightly larger 1:148 scale – but still uses the 9mm gauge track of Arnold’s design for their 1:160 scale proportion models. To complicate things further Japanese N scale is different again – because Japanese “standard gauge” is 3ft 6in between the rails. 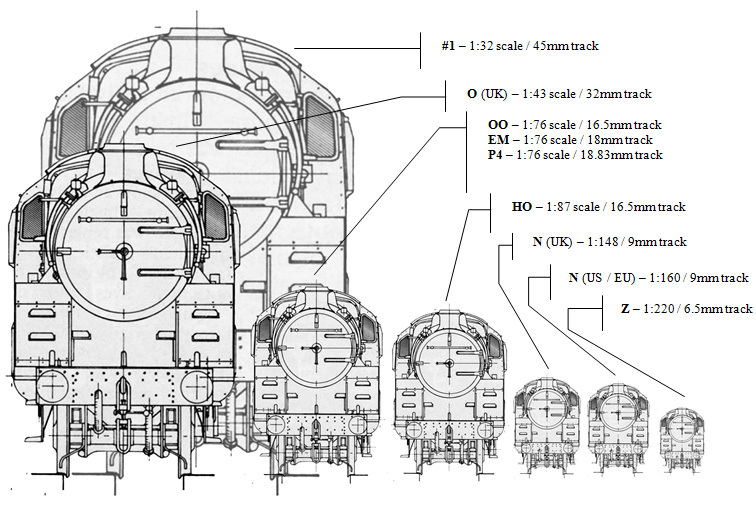 Again you may find some enthusiasts talking about 2mm / ft scale (1:152 scale) or “2mm finescale”; true 2mm modelling isn’t really part of the “N” family because it doesn’t use 9mm gauge track (it uses 9.42mm gauge track). Like EM and P4 – this is an experienced modeller’s preserve. This leads us to the only two truly accurate “off the shelf” sizes – O and HO. HO is used throughout the rest of the world in place of OO (which is manufactured only for British trains). HO uses 1:87 or 3.5mm per foot scale and 16.5mm track. European and particularly US trains are widely, and frequently cheaply, available ready to run off the shelf in this scale. Even though its smaller scale than OO – the locos tend to appear around the same size because the real things are generally bigger. O covers two scales using the same track gauge – 32mm. British O is 7mm per ft or 1:43 proportion (correct) whereas American O is based on imperial measurements ¼in per ft or 1:48 scale – slightly too small. O scale is considerably less popular than it once was, mainly due to the space required. Some less well known sizes: Z at 1:220 scale it’s the smallest commercially available size, with only two or three manufacturers of German or US trains, British Z is for experienced modellers (with very good eyesight! 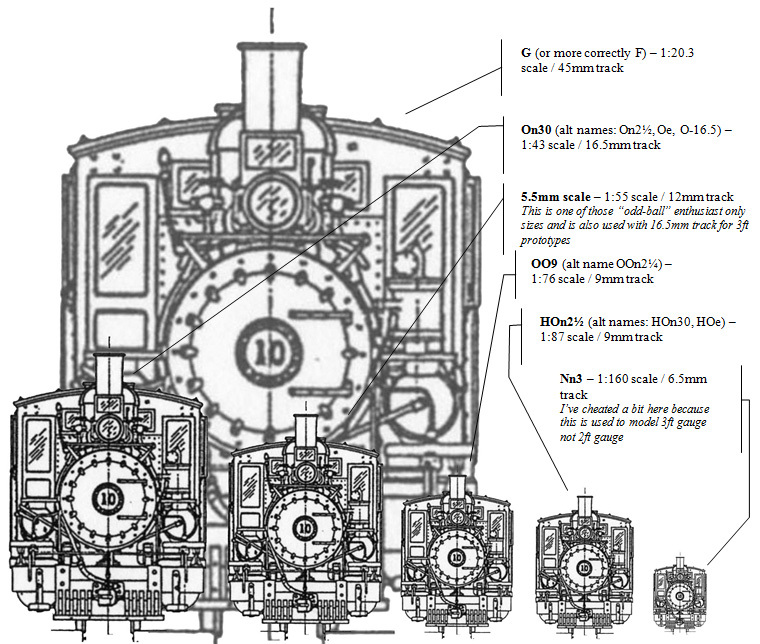 ); S – 3/16 in per ft scale (quite common in the US), TT – 3mm/ft on 12mm gauge (quite common in Eastern Europe). 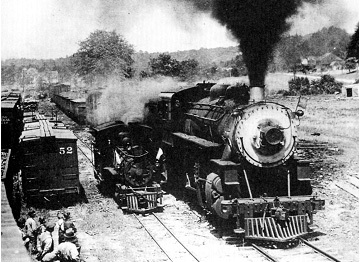 Standard gauge Maine Central 2-8-0 #510 and 2ft narrow gauge Bridgeton & Harrison 2-4-4T #5 vividly demonstrate the difference in this 1927 photo. You may hear the term “narrow gauge” used. This means that the real trains being modelled use a smaller gauge than “standard” (4ft 8½ in). In Britain the most common surviving narrow gauge is 2ft gauge (and some close companions like 2ft 3in gauge), as used on the Ffestiniog and Welsh Highland Railways in North Wales. Worldwide the most common narrow gauges are 2ft 6in / 75cm, 3ft, 1metre, and 3ft 6in (3ft 6in gauge is so common in some places it is their “standard gauge” e.g. : southern and eastern Africa, New Zealand and Japan). Narrow gauges are typically used where there are tight spaces, steep or twisty routes, or where the economic case for a railway was a bit suspect in the first place (i.e. built on the cheap). This leads to many narrow gauge railways having their own unique and sometime archaic equipment, character, and later in their lives a run down bucolic charm – this is why many modellers choose them even though there is a lot less narrow gauge railways in the world than standard gauge. With just a couple of exceptions all the narrow gauge scales are the preserve of the slightly more experienced modeller as there is very little in the way of “off the shelf” models available. By far the most common narrow gauge scale is O. O scale is used to model 2ft6in and 3ft gauge railways – many modellers use 16.5mm (OO / HO) gauge track to represent both, often called O-16.5 in the UK. Bachmann recently introduced a line of ready to run American trains in this scale (the Americans call it On30) and Fleischman has been making its German “Magic Train” models for some years (the Europeans this Oe). In Britain the second most common size is OO9 (or if you like OOn2¼). This is 1:76 proportion using 9mm (“N” size) track to represent 2ft gauge railways (and their close relatives). Although there is nothing currently available “ready to run”, the scale is quite well supported by kit manufacturers in the UK. You are also likely come across some HO size narrow gauge models. In HO there are three that have some ready to run models: HOe (European) called HOn2½ in the US, HOm (European), and HOn3 (US). These use 9mm gauge, 12mm gauge and 10.5mm gauge track respectively to represent 75cm / 2ft 6in gauge, 1 metre gauge and 3ft gauge. In particular there are lots of Swiss and Austrian HOe and HOm “off the shelf” models about due to the wide use of 75cm and 1m gauge in those countries. In the world of narrow gauge more than anywhere else there are many weird and wonderful other scale / gauge combinations – all of which have at least some devotees; many of whom now have cottage industries making kits and parts. Dating back to the earliest days of model railways is Gauge 1. This is 1:32 proportion using 45mm gauge track. Although by no means extinct as an indoor scale, its main use today is in the garden, and many modellers use live steam to power their steam locos – it’s the first size where this is really a practical option. Although there are a few “off the shelf” models available Gauge 1 is an expensive and space hungry option. Larger sizes than this do exist, but are generally considered to be model engineering – a very different branch of the hobby. Arising out of Gauge 1 is the narrow gauge equivalent: “G”, which comes from gröβ – the German for “large”. Whilst due to its size it is frequently used outside, it does not derive its name from “Garden” as I’ve frequently been told! G was invented by the German LGB company to represent Swiss and German 1 meter gauge trains using Gauge 1, 45mm track. European G is therefore proportioned correctly at 1:22.5; however, when America took to this scale in large numbers they wanted to have their 3ft gauge trains run on the same track. American G (sometimes called “F” in the USA) is therefore 1:20.3 proportion. Considering its size, its quite popular, with many “off the shelf” models being available at surprisingly reasonable prices from several manufacturers. This article originally appeared in the FebEx2014 Programme.